Cambodia is a place with which I associate positive thoughts, calmness & strength. There are not many places in the world with similar trait and beauty. It is also a place that holds many mysteries including the world-famous Angkor Wat. I wanted to discover it with my own eyes. So you can imagine how excited I was when I was told to visit Cambodia with colleagues at Odynovo (the parent brand of Indochina Odyssey Tours). 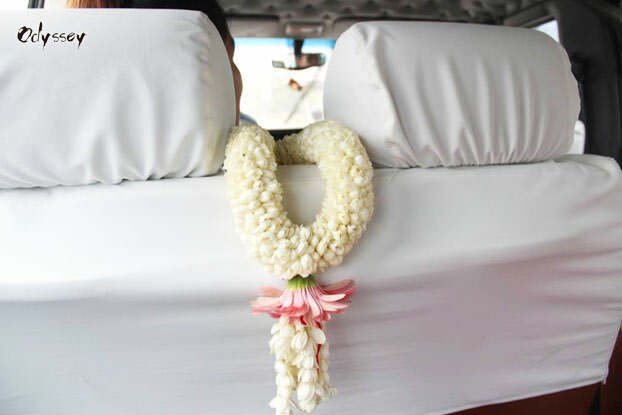 The 5-day tour covered Phnom Penh and Siem Reap, a typical route for Odyssey customers. Our intention was good: to experience Cambodia like travelers and get first-hand knowledge of the country in the meantime. Our flight made a stop in Hong Kong and finally, it took us to the capital of Cambodia - Phnom Penh! Upon arrival, we were warmly greeted with by co-workers from our local office and tour guides dressed in company uniform. With the delicate fragrance of jasmine flowers, I was instantly enchanted by this warm country. Look, the fresh garland! I love this welcoming garland! I knew it was the rainy season, I just didn't expect rain to come so soon! It was sunny the moment we stepped off the plane, but not before stepped out of the airport, it had turned cloudy. A downpour came on. We were almost stunned by the sudden of change, but it seemed not to the case of locals - they walked on the streets in no hurry, with smiles on faces, nobody even bothered to open umbrella or take shelter. Perhaps they have seen enough of sudden showers at this time of the year. 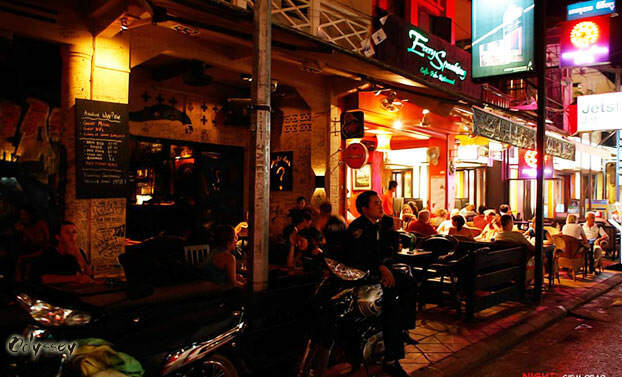 Phnom Penh, the Cambodian capital, is a chaotic yet charming city that is slowly rising from ruins. Now it’s on the intersection of fate, experiencing the crash of old and new, luxury and poverty, beauty and chaos. Our itinerary was to go to the Royal Palace, the National Museum, Tuol Sleng Genocide Museum, and the Killing Field. 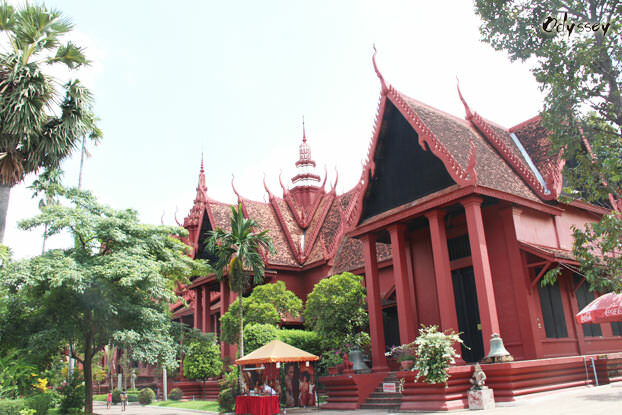 A single day is sufficient to uncover all the highlights in Phnom Penh. My favorite place in the capital - the Royal Palace! Located on the romantic riverside, where the mighty Mekong meets the Tonlé Sap and Bassac rivers, the palace is built in typical Khmer style. 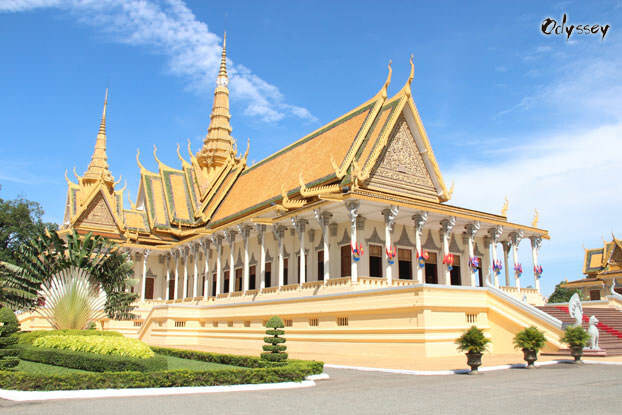 Since the mid-19th century, a total of 6 Cambodian kings have lived there successively, including Norodom Sihanouk, the former king of Cambodia. This is a huge complex of gold roofs and yellow walls consisting of 20 big and small palaces. The corridors are carved with bas-reliefs similar to those in Angkor Wat. The surroundings are beautiful with delicate flowers and trees, under the blue sky, the place looked extraordinary! The National Museum is definitely an impressive sight we didn't want to miss. The inside buildings are quite unique, all with broad, black windows and dark red frames. Apart from that, there is a pretty courtyard. The centerpiece is a small pavilion enshrined with a small Buddha statue. Four man-made lotus ponds, greenery and long benches in the courtyard make it a great place to relax and do nothing. Visits to places like the Killing Fields and Tuol Sleng Genocide Museum of Genocide are not pleasant - being confronted by this type of human cruelty is never a comfortable thing. But I think it’s important to learn about history, so that we might not repeat similar things happening in the future. After two days in Phnom Penh, we decided to move on to our major destination of the trip - Siem Reap (about 40 minutes’ flight). When our plane left Phnom Penh, we had a panoramic view of the city and its suburbs. Well arranged villages set among rice fields, rays of sunlight shine through the gold races, gorgeous. 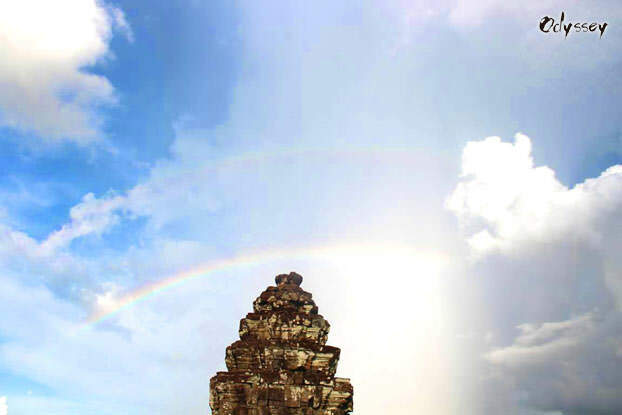 Siem Reap is a surreal city where spiritual beliefs have passed down from generation to generation. Visiting here makes one feel like in a time tunnel through past and future. We didn't head to Angkor Wat as our schedule planned; instead, we decided to visit the famous Tonle Sap Lake, which is some 30 minutes' drive from our hotel. It is the largest freshwater lake in Southeast Asia. But this is not the reason we went for. We came, actually, to discover the real life there. The floating villages have more charm than most places I’ve visited. 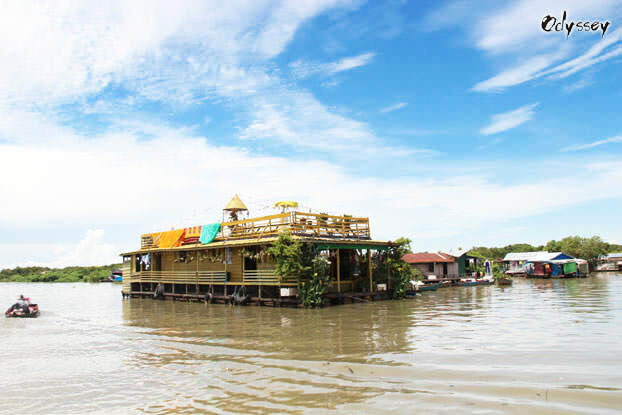 Houses on stilts are lined into an organized yet semi-chaotic maze. They are home to stores, farms, churches, schools, police stations, etc. People navigate and move between houses in small canoes etched out of logs. Kids float on big pots. People lead a leisure life. On our way back to the hotel, we stopped at a western restaurant called Asian Square Restaurant & Lounge. This is where Odyssey Tours arranges meals for our customers. The food materials are all fresh pick of the day. 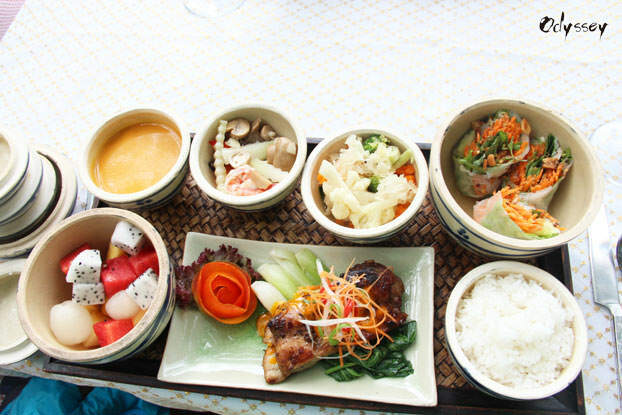 The Western dishes are catered to all travelers. The picnic is doable for both families. Couples can take a boat and enjoy the food while admiring at the sunset of Phnom Bakheng. This afternoon we came to Phnom Bakheng, which is located at 1.3 kilometers north of Angkor Wat, 8 minutes from the southern gate of Angkor Thom. 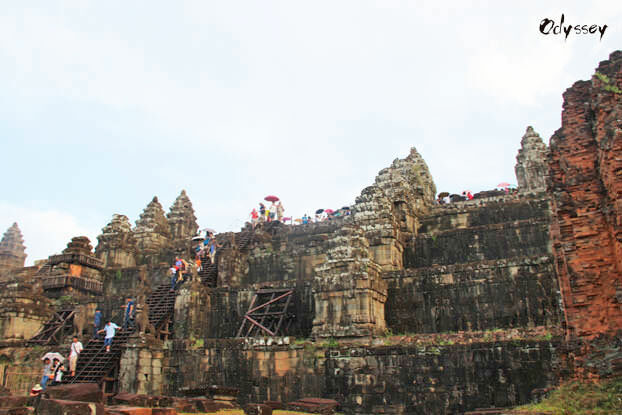 As it is situated on a hill that overlooks all of Angkor, we climbed slightly steep and narrow stairs up (15 minutes’ climb) to the base of the temple. 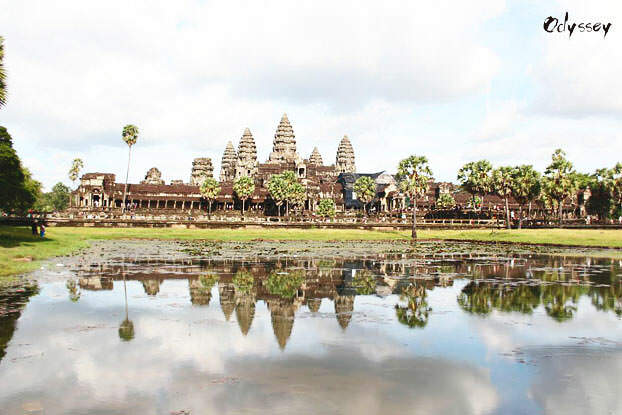 The temple was originally a palace constructed more than two centuries before the Angkor Wat. Originally there were 100 towers, but much of them are now ruins. The temple itself isn't as impressive as other iconic temples like Angkor Wat and Bayon Temple, but it is truly the best spot to experience a true Angkor sunset. And apparently hundreds of other tourists shared the same idea - even at this offseason, the place was swarming with people! Unfortunately for us all, it started to drizzle so we didn't actually get to see the sunset. No sunset, but with a rainbow! 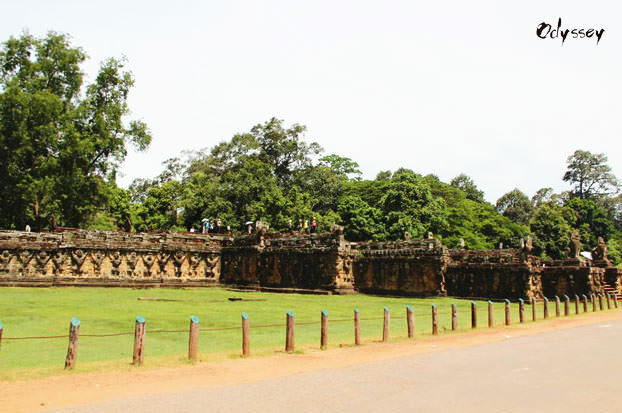 Having gotten a taste of the Angkor ruins the previous day, we certainly craved for more. So, it was a temple-hopping day! 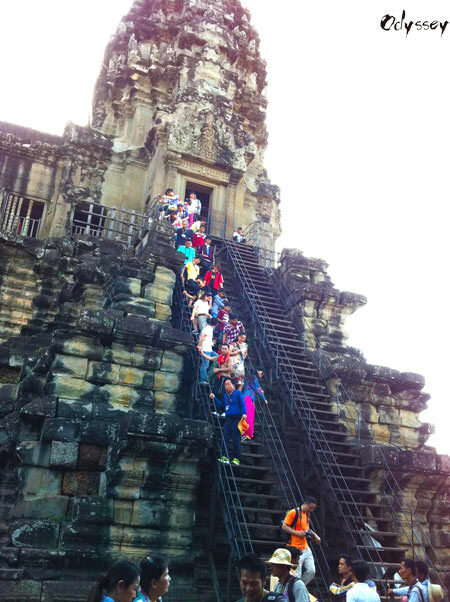 We were going to see a few the most popular Angkor temples. The whole area of temples and ruins is known as the Angkor Archaeological Park, which covers more than 400 square kilometers. Within this area, there are actually over 1,000 temples of varying sizes and states of decay, from piles of rocks to huge restored temples with details still intact. 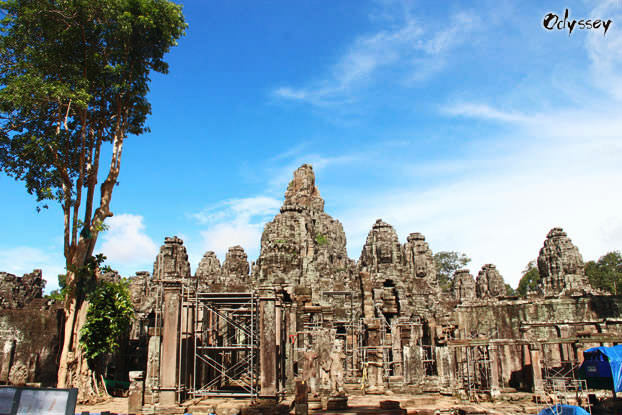 We started from the Bayon Temple, which is only 5 minutes' drive from Bakheng Hill. This is where you can easily get lost in history. With 48 four-faced towers surrounding the central one, there are more than a hundred carved faces to look out for! 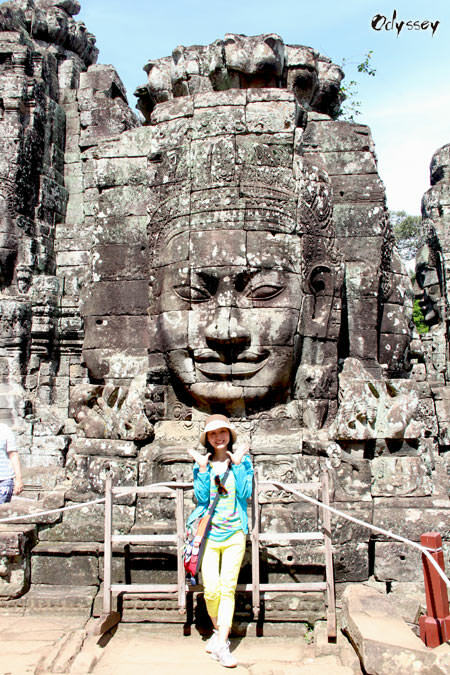 The huge, serenely smiling faces that cover the temple’s towers are what people say "the Khmer Smile". Exactly who these faces depict remains a mystery. Just 200 meters to the northwest of Bayon Temple is the Baphuon Temple. Much of the complex was crumbling, so it's hard to get to the top. We just went around the temple for a look. Moving on, we took a walk to Elephant Terrace. Spanning a distance of 350 meters, the terrace was used as a giant viewing platform for ceremonies in its heyday. It also marks the way to the royal palace. Today much of it has turned into ruins; the only thing that remains is this step pyramid, the Phimeanakas, reminding us of its glorious past. After 5 minutes' drive, we got to the famous temple of Ta Prohm. 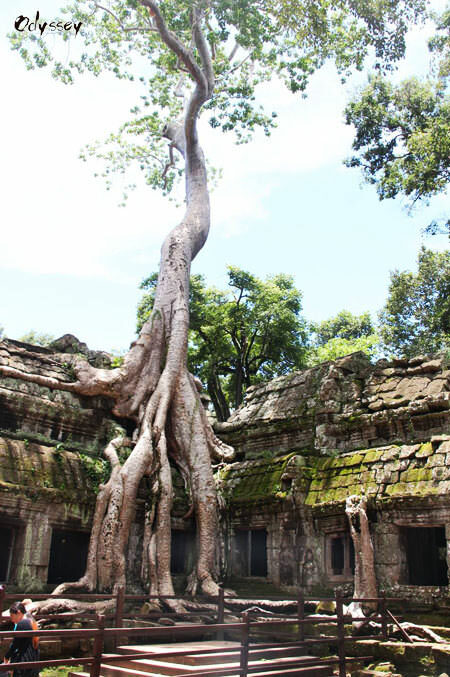 If Bayon Temple is all about smiles, Ta Prohm is about trees. Here, massive tree roots have curled around pillars and burst up through floors. Moss and vines have crept across walls and down into doorways. Spectacular and unforgettable! Some scenes from the movie Tomb Raider were filmed here. Grand temples, exquisite carvings, monks in orange robes, dark and long corridors, lights and shadows, these are the impression that Angkor Wat left on me through the screen. Even if I had seen pictures of it so many times, I was amazed by its sheer beauty as I was there in person. And finally came the Angkor Wat! Definitely the biggest highlight of the trip. Crowned with soaring towers, with intricate bas-relief, it is easily one of the world’s most memorable sights. You could easily get lost wandering around in the lower gallery of Angkor Wat, but climbing up to the upper gallery is well worth it, too. Check out those killer steps! The steepness signifies the difficulty of climbing the "stairway to heaven". In fact, the height of each step is longer than its tread, creating an angle of ascent that is bigger than 45 degrees! Quite contrary to the quietness of the countryside, the town of Siem Reap is another hustle-and-bustle scene: women stirring the palm juice, smiling street vendors, scattered stalls, and attentive craftsmen…it showed us what life is like in Cambodia. 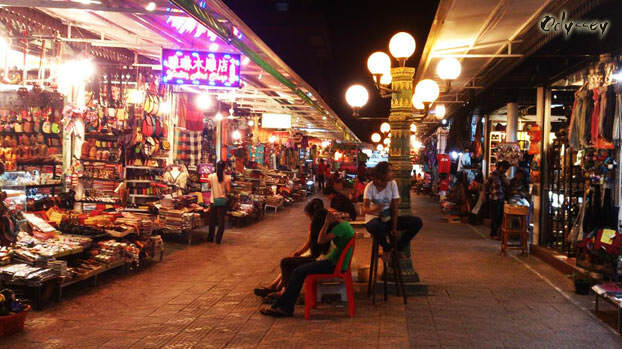 That night, determined to get at least some shopping done, we came to the Night Market. It spans across a few streets with vendors selling a variety of items including scarves, handicrafts, jewelry, clothes, bags, etc. All stalls are decorated well in the same hue. Of course, the tip I will give you is, don’t hesitate to bargain. Cambodia is a country that no tourists will feel uncomfortable with.  The Cambodians are very friendly, and many of them can speak more than one language, English, French, even Chinese. Vendors at night fair, tuk-tuk drivers and even peddlers selling local specialties talk with you in a way that makes you at ease. They harbor no discrimination against or hostility to foreign visitors. Instead, their smiling faces, frankness, and sincerity will warm your heart! The moment I arrive at Cambodia, I felt as if I were at home. The day had finally come for us to bid farewell to Cambodia. I'd like to say it was truly a fantastic experience to travel through a country that holds so many mysteries. But ultimately, I find that what made our stay particularly memorable were the wonderful Khmer people - the nice colleagues from our local office, the tour guides, drivers, and even the smiling street vendors. Seeing new things and meeting new people, isn't this the meaning of travel?